Peyton Manning is a superstar. Over 5,000 completions, almost 60,000 yards passing, 436 touchdown passes, all the while completing passes at 65% clip for his entire career. He’s a 4 time NFL Most Valuable player, a nine time pro-bowler, and holds multiple NFL records. He’s won a Super Bowl, and was the Super Bowl MVP is 2006. Manning will be in Canton almost certainly on the first ballot, and by the time that he does decide to retire will hold many of the NFL’s career passing records. With all of that being said why I am here today to explain why Peyton Manning may be overrated? This weekend’s wild home playoff loss to the Baltimore Ravens added yet another disappointing end to another typical Manning like season. Manning had an MVP like season in his first year with the Broncos. He threw for 4,659 yards with 37 touchdowns and a 105.8 quarterback rating. He led the Broncos to a 13-3 record which earned them home field advantage throughout the playoffs. As with many great Peyton Manning seasons, the postseason ended in disappointment. There is plenty of blame to go around in Denver after squandered the game away against the Ravens. John Fox can be blamed for a horrible game plan and bad clock management. I still have absolutely no idea why you wouldn’t try to get into Field Goal range in a tie game with 30 seconds left, and two timeouts left, when you have Peyton Manning under center. That was one of the strangest decisions that I have ever seen in an NFL game. If you can’t trust Manning there, who can you trust? Champ Bailey also deserves plenty of blame for getting burned badly twice by Torrey Smith for touchdowns. Smith actually torched him again later in the game but the ball was overthrown. Safety Rahim Moore deserves his fair share of the blame as well. 3rd down and 3 from their own 30 yard line with zero timeouts and 41 seconds left you absolutely CAN NOT let anyone get behind you. That was possibly the worst blown coverage that I have ever seen. There are plenty of available scapegoats in this game, but it always goes back to the quarterback. Peyton Manning didn’t lose this game (even though his 3 turnovers led to 17 points), but he did fail to pull the game out and win it. Whether or not it’s fair, quarterbacks are defined by two things: numbers and wins. Quarterbacks get the credit whenever their team wins and the blame when their team loses. This type of credit and blame is even more magnified in the postseason. Simply put, Peyton Manning isn’t the same quarterback in the postseason as he is in the regular season. Even though throughout his career Manning has almost a 70% win percentage, he is only 9-11 during his career in the post season. His 11th loss this weekend tied him for most all-time with Brett Favre. Think about this, of his eleven postseason losses, eight times his team was favored to win. Three of those times that they were favored they were favored by double digits. In his career he has also lost the first game of the playoffs an astonishing eight times! Five of those times were at home! In his 20 postseason games he has completed 63% of his passes for over 5,000 yards with 32 touchdowns and 21 interceptions good for an 88.4 quarterback rating. These aren’t terrible stats but there is clearly a difference between his regular season numbers. Completion percentage, QB rating, and yards per attempt are all lower in the postseason and his touchdown to interception ratio worsens dramatically when the playoffs begin. During 2006 when the Colts made their run to a Super Bowl Championship allowing Manning to finally “win the big one”, he didn’t play very well in that postseason at all. During the four game run to the World Championship he threw for three touchdowns and seven interceptions and only had a 70.5 ranking. That Super Bowl Championship has remained the only one that Manning has won even though he had it back to the Super Bowl a few years later only to lose to the New Orleans Saints. It’s hard to explain why a player the caliber of Peyton Manning struggles in the postseason. I have heard countless theories about the dome in Indianapolis, the way his teams have been constructed, the coaching staffs that he has played for, and even the system that he plays in. Whatever it is, his “big game” struggles go all of the way back to his college days at the University of Tennessee. He could never get over the hump in college by beating rival Florida which cost Tennessee SEC titles, and shots at the National Title. During his junior season at Tennessee he threw four picks against Florida at home in a 35-29 loss. His senior season they went into Gainesville undefeated but Manning threw two picks in a 33-20 loss to the Gators. Not many people will remember but Manning was actually benched during his last collegiate game. Tennessee was getting blown out in the Orange Bowl by Nebraska when Manning was benched after throwing his second interception of the game and he was replaced by Tee Martin. The following season after Manning graduated, Tee Martin led Tennessee to a National Title. In many of the NFL postseason games that he has lost, he has either played terribly, or made a fatal mistake late in the game such as Saturday’s overtime interception and the 74 yard pick six in the Super Bowl against the Saints that sealed the game. Whatever it is, it just seems to follow Peyton Manning in the postseason. When Manning’s career is finished, and he takes his rightful place in Canton, people will try to quantify his greatness against the other greats that have played the quarterback position. I have heard many people say that they think that Peyton Manning is THE best quarterback of all-time. I totally disagree with that based on his body of work throughout his career in the postseason. That may not be fair, but the truly great ones consistently win the big games. Peyton Manning has not won the big game with enough consistency to be considered a top five all-time quarterback. Of all of the images from this crazy, unforgettable, NFL Playoff weekend I think this image is my favorite. Two of the all-time greats together one last time . These two guys have been battling each other for AFC supremacy for more than a decade but have the ultimate respect for one another. 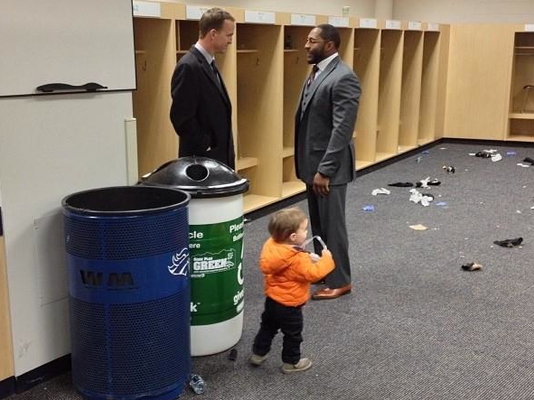 Classy move by Peyton Manning to wait around for nearly 2 hours after a bitter defeat to congratulate Ray Lewis on advancing in the postseason and on his impending retirement.